Visit iPersonic online at ipersonic.com which was developed by the psychologist Felicitas Heyne. She is a well-known psychologist and book-author. She is an international affiliate of the American Psychological Association (APA) and member of the German Psychological Association (BDP). ipersonic.com has personality tests, career tests and personality profiles to help you be the best you can be and attain your goals. Save on your next purchase from iPersonic.com with iPersonic discounts, iPersonic coupons, iPersonic promotions and iPersonic savings from 58coupons.com. For a limited time only, save 10% off your purchase from iPersonic with this coupon code. 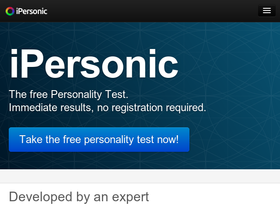 ipersonic.com is offering a free personality test. Whether you enjoy taking tests or not this one is right on the money. Click link to take the test now! At iPersonic they are offering a free career choice test. It's very comprehensive and will give you a clear view of where you need to be career wise. Click to take the career choice test now! iPersonic has created the relationship profile to help you find happiness in love. Click link to analyze your love type & create your personal relationship strategy. The Career Profile from ipersonic.com is packed with information that will help you make the best career choice for your personality type. Click link to identify your skills, interests and work values.